Consider the hand combinations when you decide to take any action at poker table. Neverminding how good you are at other games as online roulette and casino slots, poker will need much more skills more difficult than the slot tips from you. The standard poker deck has 52 cards and they are ranked from (lowest) 2 to (highest) Ace. The suits in poker games are not taken into account, which means that two cards of one value but of different suits are equal. The common poker hand in most of the poker variants (with the exception of Pai Gow and Three-card poker) has five cards. Study all about hands poker value. Remember that in the hands of equal rank the individual cards determine which hand is better. The best hands poker value in all poker game variants. It consists of Ace, King, Queen, Jack, ten of the same suit. As the suits in poker do not matter in hand values all the Royal Flush hands are equal thus in case of tie the pot must be split. The straight of five suited cards. Among two Straight Flushes the strongest and winning hand is the one with highest top card. Aces can be used to show up the highest Straight Flush (10-J-Q-K-A), that is in fact the Royal Flush, and the weakest Straight Flush (5-4-3-2-A). Four of a Kind has any four cards of the same rank, as for example, four sevens. Four of a Kind is sometimes called the "quads" and in some countries it can also be called the "poker", but such name is not very popular. In case of two or more Four of a Kind hands the one with the highest set of four cards wins the pot. Three cards of the same value and two cards with another value, for instance, three tens and two Queens. To compare the rank of two Full Houses the rank of three cards is considered first, after then the pairs of cards are checked. This hand contains five cards of different rank but all of the same suit. 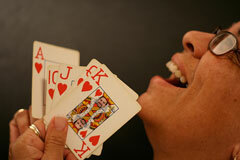 In Flush poker hands the strongest card denotes the winning hand if there is the tie. Five not suited cards in sequence. The Straight with the higher top card wins in case two or more hands tie. Three of a Kind consists of three cards of the same rank. Sometimes Three of a Kind is called the Triplets. If two or more hands tie the three equal cards are checked to indicate the best hands poker value, and then the rest two distinct cards may be used to determine the winner. The hand which has two pairs of cards, in which every pair contains two cards of the same value. Among Two Pairs hands that tie the one with the strongest pair is winner regardless the strength of another pair. If the top pairs are equal then another pair indicates the who wins. At last the odd card denotes the strongest hand. This hand contains a pair of cards with the same value and three distinct cards that differ in suit and rank. The hand with stronger pair is considered to be better. The rest distinct cards matter in case the pairs are of one value. This is the poker hand of five cards which doesn’t contain any of the mentioned above combinations. High Card has the lowest hands poker value. Among two or more High Card hands the top card is compared. This is the poker hand that usually creates tie.